Looking for a healthy dessert recipe? Then you’ll love these Maple Cinnamon Fudgy Flourless Brownies! Made with black beans, sweet potato, almond butter, cacao powder and baking soda, these gluten-free brownies are easy to make (one bowl! ), refined sugar-free, vegan, nutrient-dense AND yet they’re rich, decadent and super moist, gooey and fudgy! 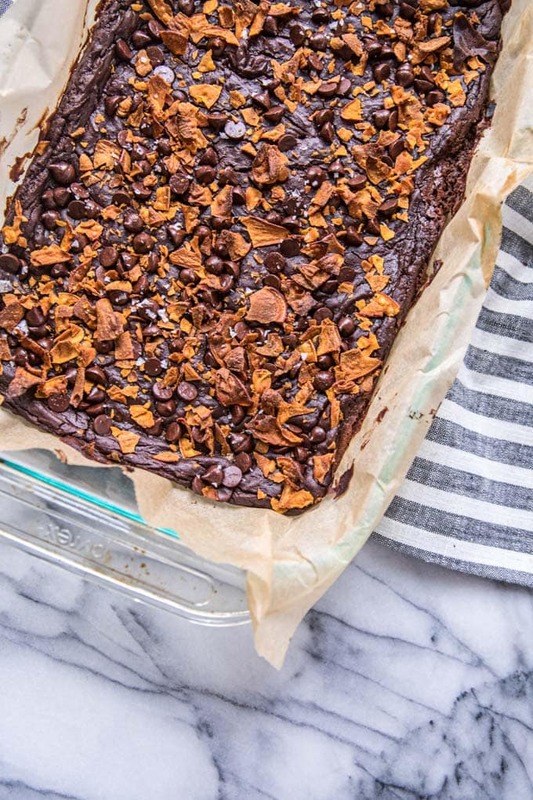 The perfect way to sneak more veggies and plant-based protein into your diet–no one will ever guess these flourless brownies are actually good for you! 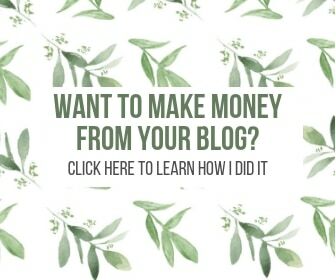 What if I told you that you could make a rich and decadent dessert with vegetables? What if I told you that dessert would be high in plant-based protein and fiber, but low in calories and fat? What if I told you that dessert would be sweet and fudgy, moist and indulgent but without any flour or refined sugar? And what if I told you that same dessert was so nutrient dense that it could improve your eyes, skin, bones, reproduction and immune system health? 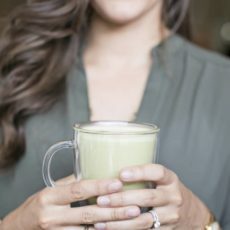 So full of nutrition that it could help lessen anxiety, prevent headaches, improve digestion, aid in detox AND boost energy. 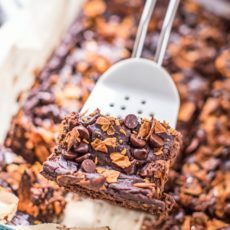 I know it sounds crazy, but instead of flour, these fudgy brownies get their bulk and density from black beans and sweet potatoes. Because of their high moisture content, the brownies are gooey and fudgy, but also gluten-free and super healthy! I also add a little baking soda and almond butter to get the texture just right and to make the flavor out of this world I rely on a seriously delicious combo of cacao powder, instant coffee, vanilla extract, maple syrup (read: no refined sugar!) and cinnamon. Outrageously delicious doesn’t even begin to describe it! And these flourless brownies couldn’t be easier to make–literally just throw everything in a food processor, pulse until smooth, spread into a baking pan and bake for 45 minutes. Done. Now, of course, you could stop the recipe here and still have a delicious batch of fudgy brownies on your hands. 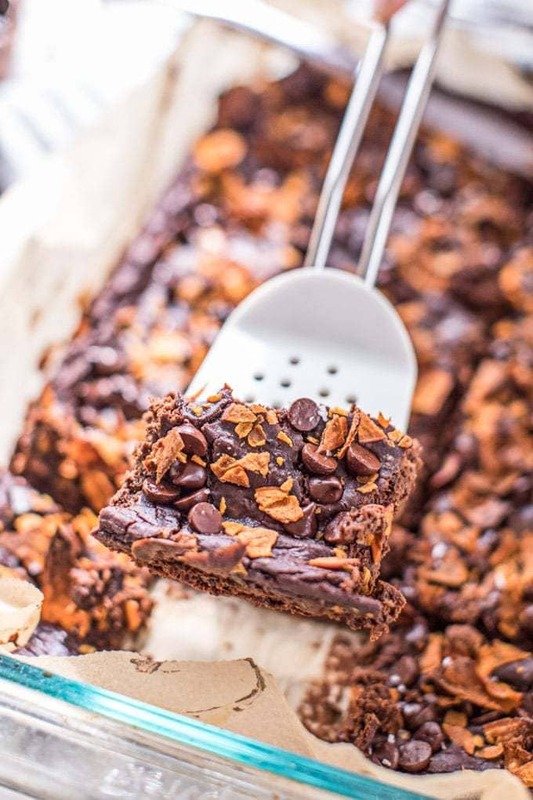 But if you really want to push these brownies over the top and achieve that perfect sweet and salty combo, then you’re definitely gonna want to take this next step. 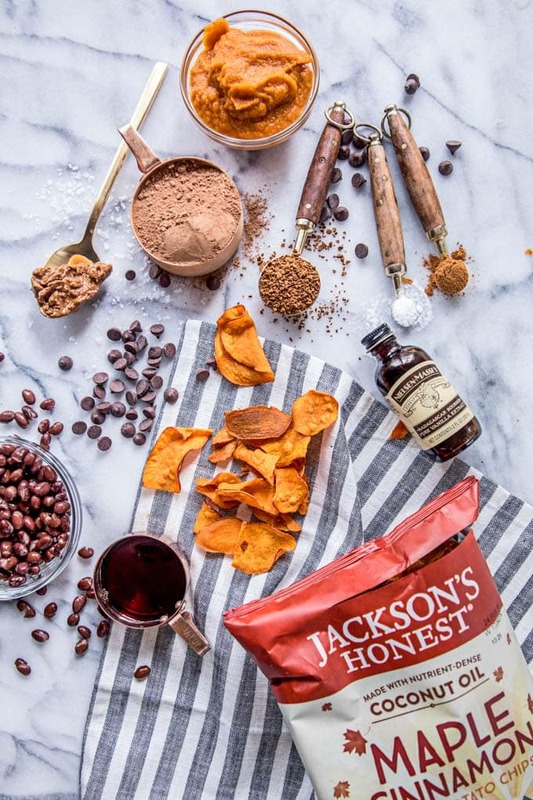 Grab you a bag of Jackson’s Honest’s Maple Cinnamon Sweet Potato Chips. Crumble them over the uncooked brownie batter. Top with organic, bittersweet dark chocolate chips (I recommend these) and bake. When the brownies are done cooking, sprinkle with big flaky sea salt (I love Maldon sea salt) and wait for your head to explode after you take that first mind-blowing bite. 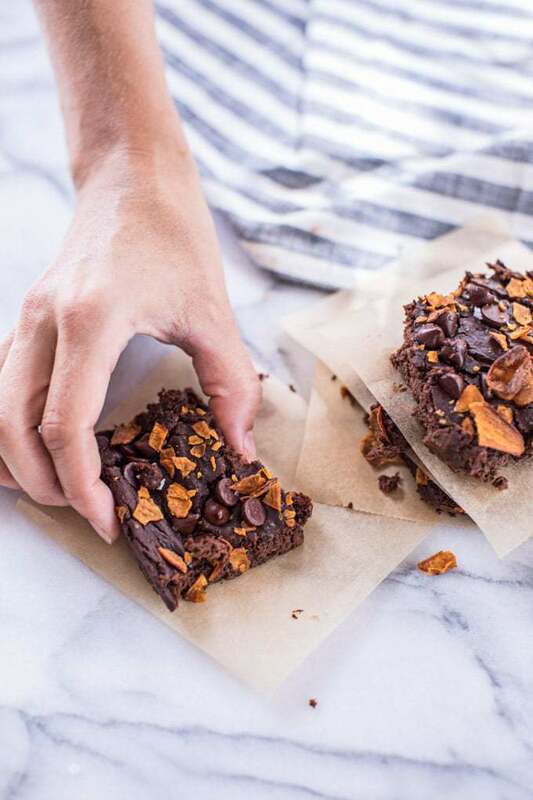 Admittedly, adding the sweet potato chips and chocolate chips does add a smidgen of refined sugar to these brownies, but it’s just a teeny tiny bit and it is SO worth it. 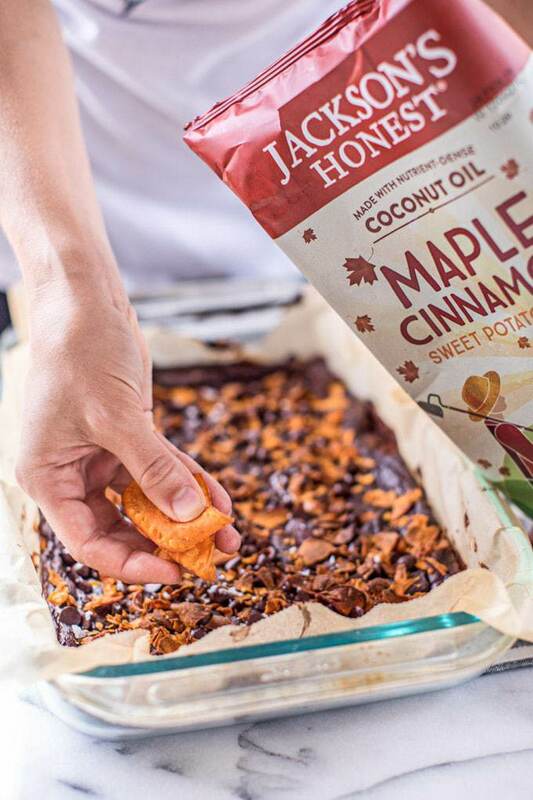 I’ve told you before about my love for Jackon’s Honest chips–they’re made with organic and/or heirloom Non-GMO ingredients that are cooked in heart-healthy coconut oil and contain no artificial flavors, colors, preservatives or toxic chemicals. You can find Jackson’s Honest chips at grocery stores nationwide (including Publix, Whole Foods, Earth Fare and Sprouts), or you can buy them online direct from Jackson’s Honest ($3.99 per bag), on Amazon Fresh ($3.00 per bag) or at Thrive Market ($2.99 per bag). You’ll notice that these brownies call for organic raw cacao powder instead of traditional cocoa powder. And there’s a VERY important reason for that! For starters, cacao is the raw form of chocolate–it’s minimally processed (cold-pressed), and slightly bitter because it’s unsweetened (as opposed to actual chocolate). But most importantly, there is a HUGE nutritional difference between the cacao and cocoa. Cocoa powder is a much more processed ingredient that’s been roasted at extremely high temperatures, changing the molecular structure of the cacao bean and thereby reducing its nutritional value. And let me tell you, there’s a lot of nutrition to be had from cacao! Did you know raw cacao powder contains more than 20 times the antioxidant power of blueberries? Yes, I’m talking about chocolate! Cacao is actually chockfull of nutrients, particularly calcium, zinc, iron, antioxidants, vitamins B, C and E, protein, fiber and heart-healthy oleic acid (an essentially fatty acid). And in fact, eating raw cacao powder can lower insulin resistance, reduce blood pressure, and protect your body from free radicals and other ills like heart disease and stroke. Goodbye Hershey’s, hello Navitas Naturals. Don’t worry–the chocolatey taste of these flourless brownies is still rich and velvety and very decidedly chocolate. Nobody would ever be able to tell the difference! Seriously, I did a taste test with my friends and had them guess what was in these brownies. It took about a dozen guesses before someone shouted out black beans, and they only knew to guess that after I hinted that there wasn’t any flour in the recipe. 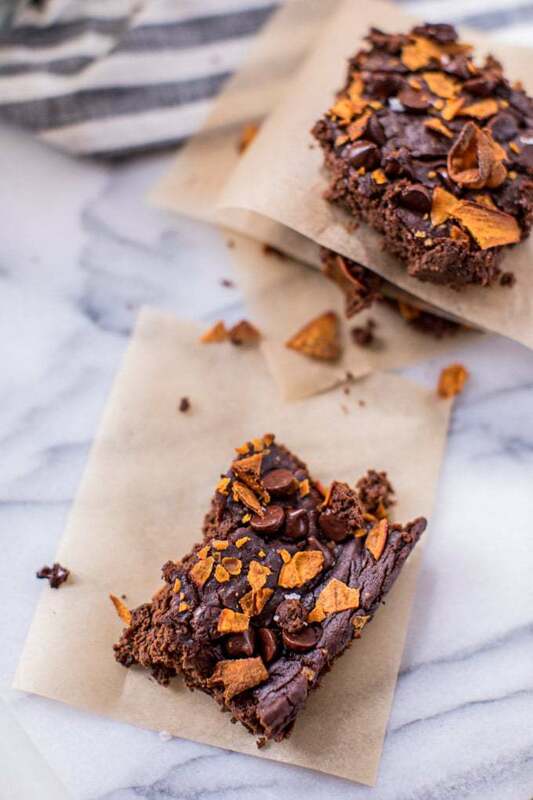 These flourless brownies are the perfect way to sneak more veggies and plant-based protein into your diet! So you won’t have to feel guilty when you eat half the pan in one sitting like I did. If you give this flourless brownie recipe a try, let me know! Leave a comment, rate it, and tag a picture #rootandrevel or @rootandrevel on Instagram so I can see. Looking for a healthy dessert recipe? Then you'll love these Maple Cinnamon Fudgy Flourless Brownies! Made with black beans, sweet potato, almond butter, cacao powder and baking soda, these gluten-free brownies are easy to make (one bowl! ), refined sugar-free, vegan, nutrient-dense AND yet they're rich, decadent and super moist, gooey and fudgy! 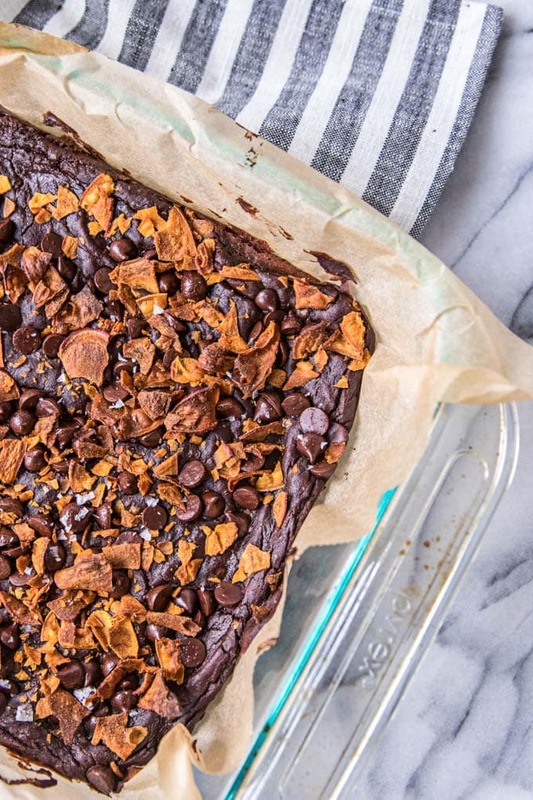 The perfect way to sneak more veggies and plant-based protein into your diet--no one will ever guess these flourless brownies are actually good for you! Preheat oven to 425F. In a food processor, combine the first 9 ingredients (black beans through baking soda). Pulse until thoroughly mixed and smooth. Pour brownie mix into a 9x12 baking dish lined with parchment paper. 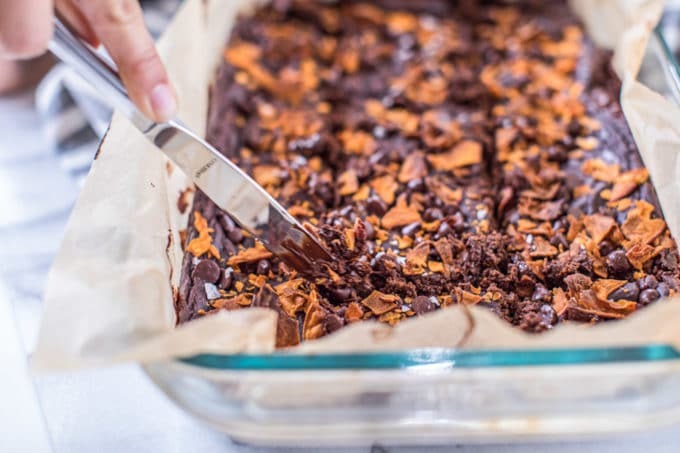 Top with chocolate chips and crumbled sweet potato chips. Bake for 40-50 minutes, until brownies are fully set and a toothpick comes out clean. Let cool for 20 minutes to firm up. Sprinkle with flaky sea salt and cut into squares--should make about 12-15 brownies. Serve and enjoy! I am so excited to try this recipe! 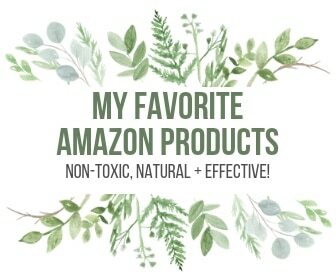 Do you drink the beans and sweet potatoes, or use their liquid as well? Sorry for the typo. Do you “drain” the beans and sweet potatoes? Yes, I drain the beans and rinse them first. The sweet potato is pureed so I just put it straight in from the can. Can’t wait to hear what you think Jeanette. Thanks so much for the clarification! I made these and !Wow! They were great! Everyone from my 4 year old granddaughter to my foodie friends thought they were delish! Also nice t think they aren’t totally empty calories. Hard to believe that you can have a treat like this on a clean eating plan. ( I did use the chocolate chips and realize they aren’t ok with most plans. I think these would be delicious without them, also. I leave off the salt and potato chips for personal preference). 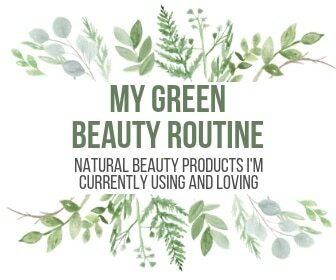 I’m SO happy to hear how much you and your family and friends enjoyed these, Jeanette! Thanks for letting me know and sharing your tweaks. These look CRAZY delicious! And I love all those ingredients 🙂 I saw Jackson’s Honest on Shark Tank; so glad they’re doing well! This looks delicious! 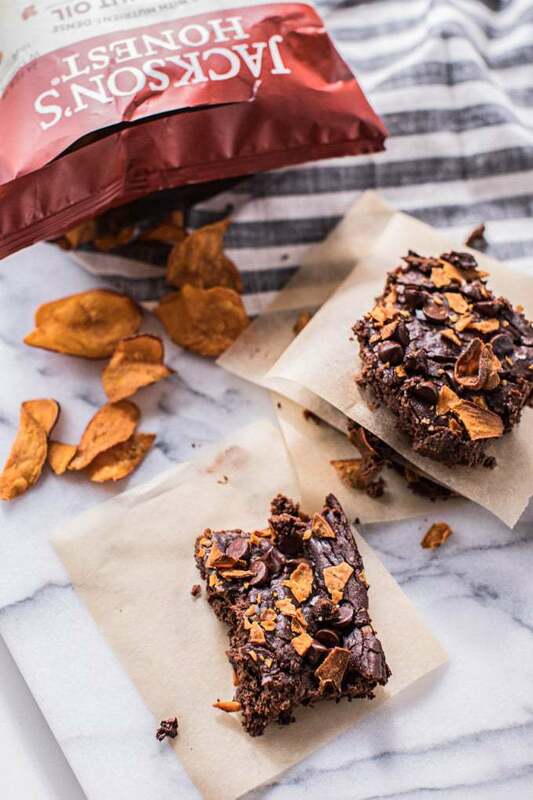 The sweet potato chips are a great idea! I love salty and sweet combination. 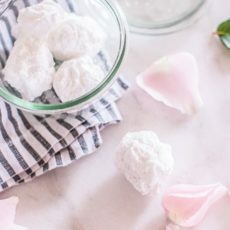 I love that the ingridients are so clean, a great healthy dessert for the holidays. Not only am I LOVING the flavor combo, but these babies are flourless! What a perfect-for-fall dessert. Can’t wait to make a batch and then devour them! These brownies look phenomenal! So fudgy and full of chocolate. OMG – the chips sound amazing!! I’ve never seen them in local stores here but I’d definitely buy. The measuring spoons with wooden handles in your photos are adorable. Super cute! Thanks so much Julia! 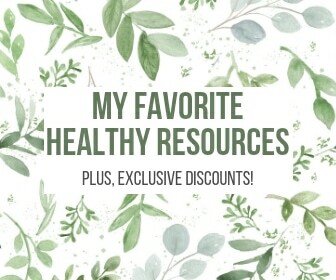 You can usually find the chips at health food stores, some local groceries stores (like Lowes here in the south), and many of the flavors online at Thrive Market. I seriously cannot WAIT to make these! So happy they are vegan and GF. I just tried Jackson’s Honest regular sweet potato chips last week and OMG, I’m an addict now. 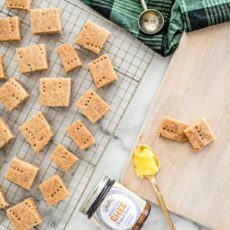 Will have to get my hands on these Maple Cinnamon ones next! Haha, yes, aren’t they just the BEST chips? !